My tribute: Why do I keep on Sinning???!!! At the time of our accepting Jesus as our Lord and Saviour - we were given the gift of the Holy Spirit. God replaced our old hearts and our old longings which were always rebelling against Him and put inside of us a new heart and a new longing with new desires which enabled us to follow and obey Him. How can we as believers keep from sinning? This question has been posed to me a few times by Christians - some who have are brand new in their faith and some surprisingly that have been on the road with Jesus a long time and yet struggle with sin, struggle with the uncertainty of being saved at all and struggle with the fact that no matter how hard they strive they just can't seem to get away from the sin which so easily invades their lives and in so doing separates them from God. I have also heard of others wanting to become Christians but questioning their own ability to "hold on" to that faith and not being sure if they can live the Christian life at all. Well, I certainly don't pretend to know all the answers but can only go on what I have learnt from this perplexing question from experiences in my own life and of course my personal life walk with Jesus. The last thing I want to project to anyone is the "Well, we are all going to sin, what of it? Sin, sin sin - go ahead - just confess it and that's all there is to it". In Galatians 5:17 Paul tells us "For the flesh desires what is contrary to the Spirit, and the Spirit what is contrary to the flesh. They are in conflict with each other, so that you are not to do whatever you want"
So here we have Paul telling us straight out that we as human beings, saved by grace through the sacrifice of Jesus, have this war thing going on inside of us. All of us have "in-built" sin inside of us - even though we have been washed and God sees us as pure and clean (when he looks at us He sees what Jesus did for us) we still have the residue, if you like, of sin still lurking around inside just waiting for an opportunity to trip us up. We shouldn't try to deny the fact that we have this 'in-dwelling' sin inside - we shouldn't try to explain it away or act like it isn't there - or tell ourselves that we shouldn't have it. BUT the thing is that we do have the Holy Spirit as well WOOHOO!! and THAT is what makes a huge difference from us to the world at large. There is this inner-war thing going on inside all believers. The very moment we accepted Jesus and the Holy Spirit moved in, our old sin-life became so angry that the warfare began! Unbelievers don't have these feelings of warfare because sin holds no guilt for them - just like we were before the Holy Spirit took up residence and decided to 'clean-house' in our souls and gave us a longing and a desire to do Gods will. BUT, we also have our humanity inside of us as well - and humanity on it's own is naturally hostile to God and so our human spirit and the Holy Spirit is as it were rivals for 1st place in our lives. Unfortunately, sometimes, if we don't keep our eyes on Jesus and we are not walking with him in the Spirit then we can easily fall for Satan's old tricks and stumble. That's why it is so important to 'walk by the Spirit" with our Lord which literally means we do what we do each day by the Spirit of God - we live each day as it comes with all of it's details, trials, joys, triumphs and disappointments, always being lead by the Holy Spirit. Well, that's fine but how do we "walk by the Spirit?" What human nature tries to do in our lives is the exact opposite of what the Spirit is doing in our lives. Our human or flesh lives gets it's satisfaction from our independence, other peoples praise, wealth, power and a host of other things while the Spirit is never ever controlled by any of these things. 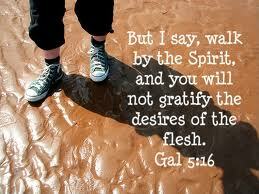 That is what Galatians 5:17 means - Our human nature produces desires and the Spirit produces the opposite desires. So, when we walk by the Spirit we are walking each day with desires that are stronger than those produced by our humanity. And so we are enabled as it were by the Holy Spirit to knock those desires over the head each and every time they try to bubble up the surface. To keep walking by the Spirit - we need to pray - Psalm 51:10 says "Create in me a clean heart O God and put a right spirit within me" and that 'right' spirit is the on-going work of the Holy Spirit gifted to us on our conversion. To keep walking by the Spirit - we need to Trust God - Faith in Him should not depend upon 'feelings' or emotion - rather than that, God desires us to simply place our faith in His trustworthiness and above all the Promises of His word. Faith in God is believing His word over anything we may see, feel, hear or experience!! To keep walking by the Spirit - We need to honour God by our lives - simply doing!! Doing things out of a grateful and thankful heart - things which probably you never thought you would ever do before you became a Christian. Jesus Himself not only acted but lived by "Walking by the Spirit" - everything He did was done through the Holy Spirit. Yes, because we live in this world and we still have our basic humanity - we will still sin! - That is a given. But we no longer have to be ruled by that sin. Jesus came to earth, died and rose again to smash the chains of sin in our lives - we are free from the shackles we no longer have to dwell in the past. 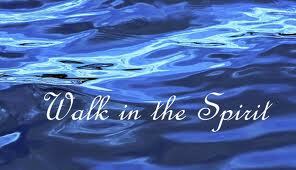 We desperately need to walk by the Spirit - the very Spirit of God! We need to surrender our will to the Holy Spirit and trust that still small voice that directs our wills and our motives. Simply put, we are to to walk in total submission to the Holy Spirit just like Jesus did while He was here. So, we will sin while we are here - but to keep on sinning and feeling no shame, no guilt is impossible! Come to Jesus when we do make mistakes and we will! - He is so ready to forgive - then rest on His amazing and awesome promises that our sins are far removed and that they have no real hold on us anymore. Friends, like Jesus we can walk by the Spirit - we can act by the Spirit, we can LIVE by the Spirit. We need, like it says in Col. 3 & 2 Cor. 12 - "I can do ALL things through Christ who strengthens me; for He is both my life and my strength."